This entry was posted on Sunday, June 28th, 2009 at 1:00 am	and is filed under C++, STL. You can follow any responses to this entry through the RSS 2.0 feed. Both comments and pings are currently closed. It would be interesting to see what the cause for the speed difference is, i.e. to compare the implementations. I’m having a hard time getting around those graphs. What does the insert graph mean ? I can’t really imagine that inserting one element into a list ( not at the end or beginning but somewhere in the middle ) should be that much slower than doing the same op on a vector. The numbers are still a little suspicious. 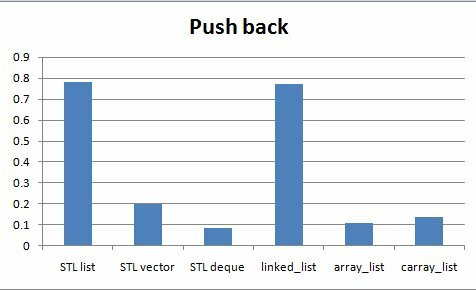 “insert” is ambiguous; std::vector is optimized for push_back (append operations), std::deque is optimized for constant time push_back and push_front. If another container is able to do better than the STL implementation you’re using, then it’s a bug in your STL implementation. The search chart is more troubling. How exactly are you searching? Both std::vector and std::deque have random access iterators, so you should be able to get log(n) search time – the best possible. std::list only has bi-directional iterators, so by definition it only offers O(n) search time. I suspect you have an unsorted container and are just doing std::find, which just does a linear walk. This is suboptimal, typically when searching a container is an important operation, you ensure the container is sorted and do binary searches. * When searching, you should be using the member function search/find etc on the stl containers if present, otherwise use std::binary_search (to test t/f) or std::lower/upper_bound (to actually get the element). And the container, obviously, should be presorted. It’d also be helpful if you posted source code when you make such claims. Hi ADL – See the reference to the previous post for details on methodology and source code. Insert is more correctly named push_back. 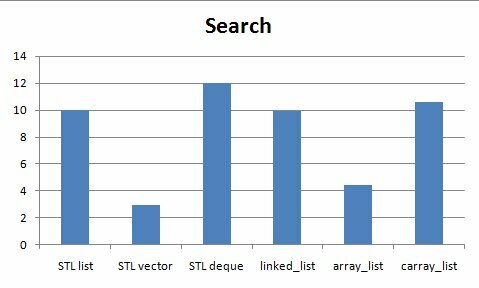 Searching is using the stl::find algorithm for STL and its an unsorted search. A sorted search is another test. What’s your compiler and compile option? Debug version or optimized release version? The result is dramatically different.